The University of California Riverside is a branch of the University of California system in the city of the same name. 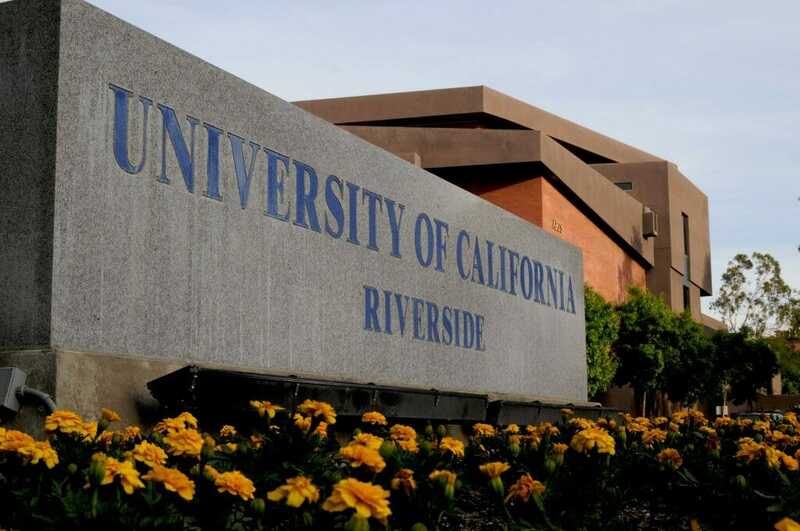 The University of California Riverside also goes by the names of UC Riverside and UCR. Though the school gained university status in 1959, its history dates back much further than that. It served as an experiment station operated by the University of California in the early 1900s and performed experiments in citrus growing and harvesting. After this station moved to a new location, locals lobbied the state to build a new school in Riverside to meet the needs of the growing number of soldiers returning from World War II and using the GI Bill to pay for college. The school opened in 1954 and became a university by the end of the decade. UCR is now home to several colleges that each maintain and operate different departments that offer various programs and classes, but the campus is also home to two schools that offer professional programs. It offers more than 140 degree programs and choices for students at the undergrad, graduate and doctoral levels. Washington Monthly ranked UCR as the nation’s 12th best school, but others that ranked the university as a top American university include U.S. News & World Report and the Academic Ranking of World Universities. More than 21,000 students attend the university, which has an acceptance rate of more than 60 percent among undergrads. The Western Association of Schools and Colleges (WASC) and its Senior College and University Commission (SCUC) accredited UC Riverside. This is a type of regional accreditation that applies to all the programs, including both degree and certificate programs, that the university offers. Students attending the university can also use this type of accreditation to meet the requirements for getting federal financial aid. Some of the programs offered by the university have accreditation as well, including accreditation from the American Psychological Association (APA), Accreditation Board for Engineering and Technology (ABET), Liaison Committee on Medical Education (LCME) and the Association to Advance Collegiate Schools of Business (AACSB). Both the application that prospective students use and the steps required to apply differ for those applying for a spot in an undergrad program and those applying for a graduate program. Incoming freshmen must use the freshmen application. These students will need to take 15 specific credits while in high school that include two full years of history classes, four years of English classes, two years of a foreign language and lab science classes and three years of math classes. Incoming students will also need to take one year of a visual or performing art and at least one elective designed for college students. The university will only accept students with a grade point average of 3.0, and those applying from outside California must have a GPA of 3.4 or higher. UC Riverside requires an official test score, a completed application, a response to a personal essay question and payment of the application fee. The Master of Science in Engineering program that UC Riverside offers now has a specialization in data science available, and students can complete this degree online. This and other graduate programs have a separate application and use a different application process. Students must use the application designed for its graduate school and take the GRE. The university asks for an official score from that exam and a transcript from the college where the student earned a bachelor’s degree. Students must also submit three letters of recommendation. Two of those letters should come from professors within the field of study the student selected, and the third letter should come from the student’s adviser. Undergrads pay around $15,680 a year for both tuition and fees, but the total cost of attending the university depends on where they live. UCR charges around $17,000 a year for a meal plan and a dorm room in one of its residence halls. Those who live in one of the university apartments will pay more than $10,000 a year for room and board. Nonresidents, who are students who do not live in California, pay a tuition rate of around $28,000 a year. Tuition for graduate students who are California residents is around $3,800 a year, but this figure increases to more than $10,000 a year for nonresidents. All students have the right to apply for financial aid and get a response back from the university. UCR asks that students file the FAFSA as soon as possible and allows students to file before they submit their college applications. Undergrads usually qualify for more financial aid and have access to different programs and packages. UC Riverside sends out financial aid letters that detail all the awards given to a student. A letter may include grants from the state and/or federal government, loans from the government, scholarships and acceptance into the university’s work study program. UC Riverside announced in 2016 that it would add a data science specialization to its engineering program, which is a master’s level program. This is one of just several specializations available to engineering students. The official name of the program is the Master of Science in Engineering (MSOL) program. UCR students can finish the online program in only 13 months and from almost anywhere in the world. There is no residency requirement in this program. Students will need to take four core classes: engineering in the global environment, introduction to systems engineering, principles of engineering management and technology innovation and strategy for engineers. They will also need to take a course on engineering projects and choose four advanced classes to take. Undergrads have the option of enrolling in a business program and taking courses relating to business analytics. U.S. News & World Report ranked this as one of the top undergrad business programs in the country. Majors can pick a concentration in finance, accounting, management, information systems, marketing or operations and supply chain management. This last concentration features courses such as business analytics, practical business forecasting, simulation for business and project planning and control. All University of California Riverside business majors take the same core classes that include management writing and communication, decision analysis and management science and organizational behavior.